But man, being a girl is expensive - the hair, the nails, the waxing (all over - lol), the makeup. Let's not talk about clothes or shoes — or the undergarments that make us look good in those clothes. And what about the dang accessories to go with the outfit - the fashion belts, jewelry, cute handbags. And then you want me to do what? $%#t! Even though I don't consider myself high maintenance — minimal makeup, conservative clothing (for the most part), comfortable shoes — I feel like I need a raise just to look presentable ! I know, I know: Some guys are into grooming just as much as some women. But I'm just doing a little venting on this rainy afternoon. I have to admit though, don't you feel good when you look great? It's definitely a confidence booster. 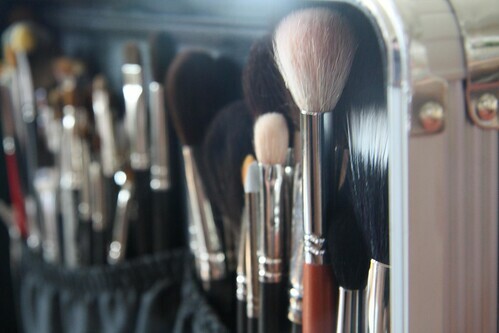 Do you know anyone who won't leave the house without makeup? Will you? Do you know someone who will refuse to attend an event because her hair isn't done? What about you? Have you ever decided not to go somewhere because you didn't have anything to wear (even though you have a closet full of clothes)? Can you tell when someone's feet hurt in her super cute shoes? Has there been a time when you've thrown on sweatpants, a baggy t-shirt, old sneakers and a hat to make a quick run to the grocery store - and then ended up in Target? How do you look when you go to the gym? Does your top match your shoes? Are you fully made up or do you wear a scarf to protect your hair? Would you date a guy who gets manicures? Tell me your stories about being a girl.